Goal was written by Dr.Eliyahu M.Goldratt as a marketing ploy to sell their software which did some scheduling. No one knows about the software - but the book became a roaring success - after rejects by 20 publishers. The book brings out some interesting concepts - even though it revolves around a manufacturing plant - it soon becomes apparent that the concepts can be applied against any industry or business. 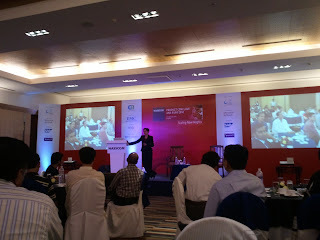 Last week I attended the Nasscom Product Conclave. Lots of take aways. I am reading Goal now ( a dedicated post is needed for the book ) and it taught me a new life lesson. 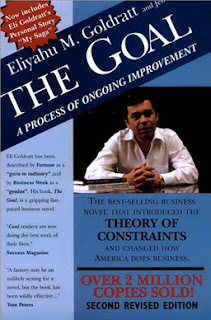 Constraints are not a bad thing - they are the best thing that can ever happen to you. A few sessions reflected this thought process and brought some clarity. For a Bootstrapped Startup - Cashflow / Money is the constraint. It shapes the way we think and act. Every Rupee that is spent is well thought out. Wastage is out of question. No unwanted feature creeps into the product - keeping the product spiffy and on its toes. The code / server is optimized to extract every ounce of performance as infrastructure is expensive and eats into the bottomline. I can keep adding lot other things - I appreciate the constraint bootstrapping provides - it is actually creating the character of the future company that has started shaping up.